Recorded on August 1, 1955; December 15, 1956; March 24, 1958. Total time: 73:18 (CD 1); 74:34 (CD 2). 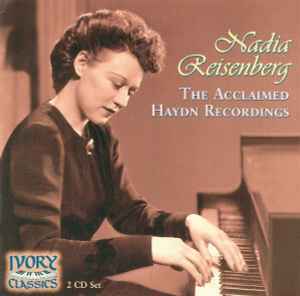 Originally released on 3 LPs at Westminster: Haydn*, Nadia Reisenberg - 4 Themes With Variations, Haydn* - Nadia Reisenberg - Sonatas For Piano, Vol. 1, and XWN18358. Cat # 64405-70806 on the back cover and on labels. Cat. # 70806 on spine.